Today we’re talking fudge. 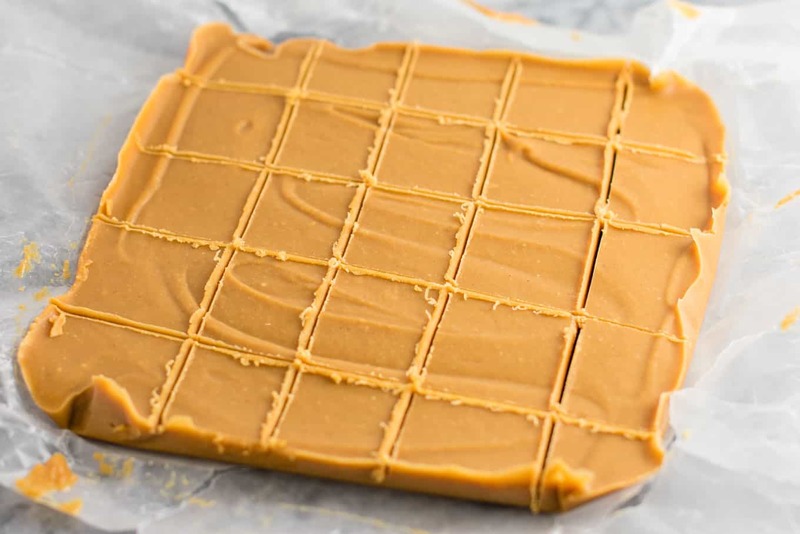 Vegan peanut butter fudge to be specific. This easy healthy dessert is made with just 6 ingredients, and is great to keep in your freezer for when a sweet tooth strikes! I love eating healthy no bake cookies and fudge year round, and this is a great dessert to cool off with in the summer, or make in place of traditional fudge at Christmastime. The ingredients are simple and wholesome, and you don’t need any fancy techniques to make the recipe. 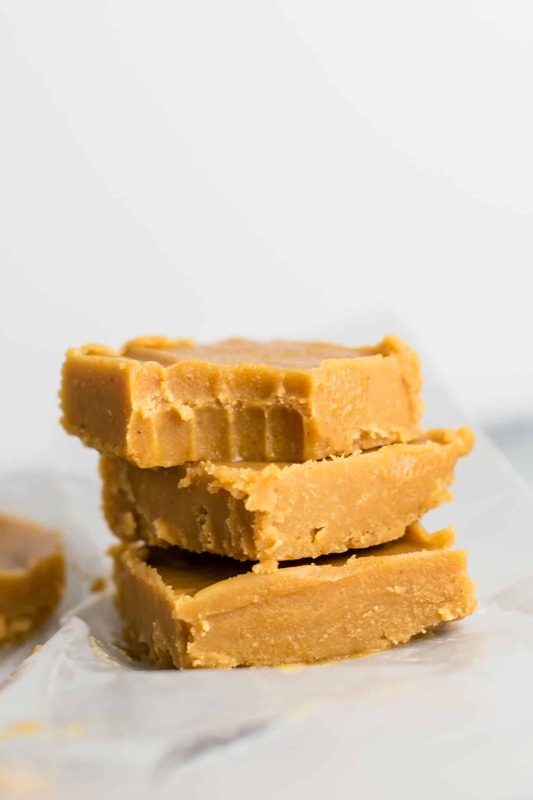 Just plain, simple, delicious fudge that you can make in less than 10 minutes. With only 6 ingredients, it is super simple to make and ready to freeze in less than 10 minutes. This recipe is so easy that even your kids could make it! First, add peanut butter, coconut oil, maple syrup, vanilla extract, and salt to a sauce pan. Whisk over medium heat until melted and combined. Stir in the coconut flour and whisk until mixed in. Line an 8 X 8 dish with wax paper and pour the fudge batter into it. Flatten the top using a rubber spatula. Transfer dish to the freezer and allow to set at least one hour. 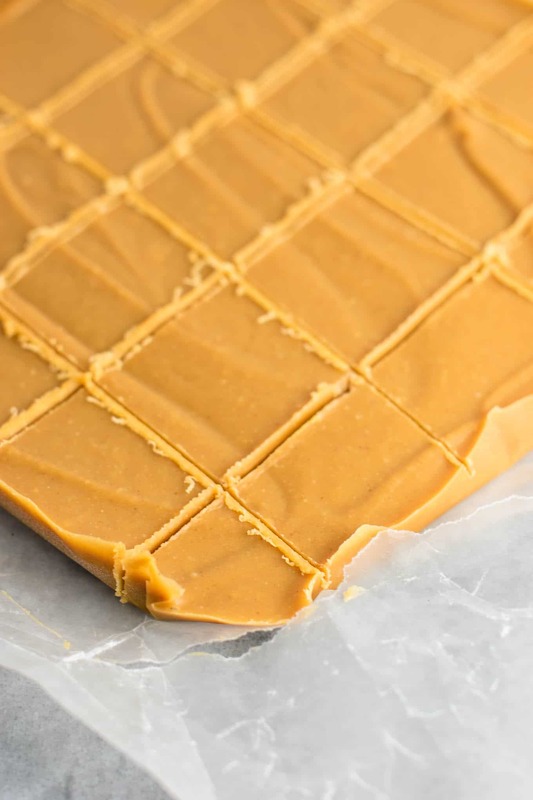 Once fudge is set, remove from freezer, lift the wax paper with the fudge out, and cut it into pieces. 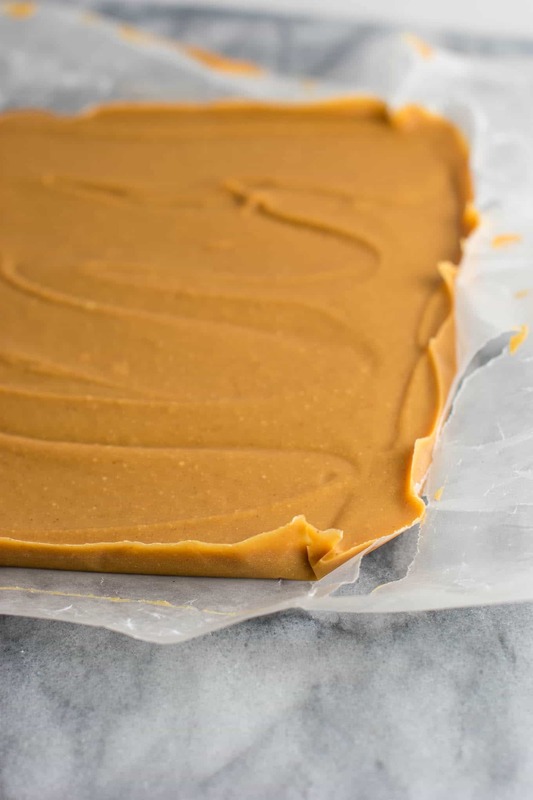 Transfer fudge to a container and put back in the freezer to enjoy chilled! 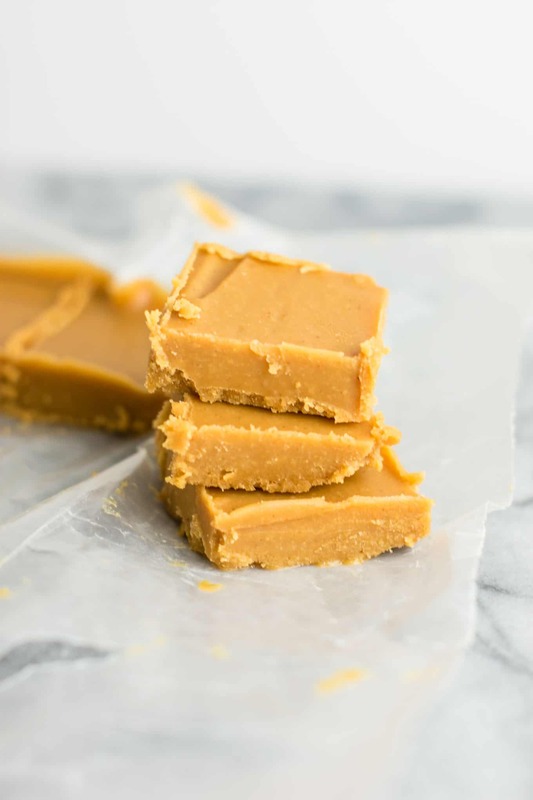 This fudge is super creamy and sweet without being full of artificial sugar and junk. I love using pure maple syrup to sweeten recipes for a slightly healthier alternative to traditional sweeteners. 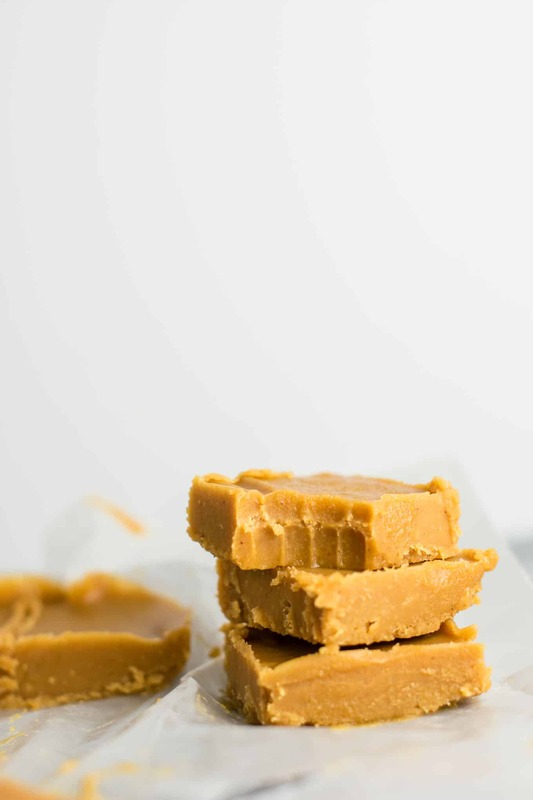 This fudge has WAY less sugar in it than a traditional recipe would but is still plenty sweet. Just a little salt adds the perfect slight contrast for this sweet dessert. If you have sea salt flakes, you could also use those in place of salt! 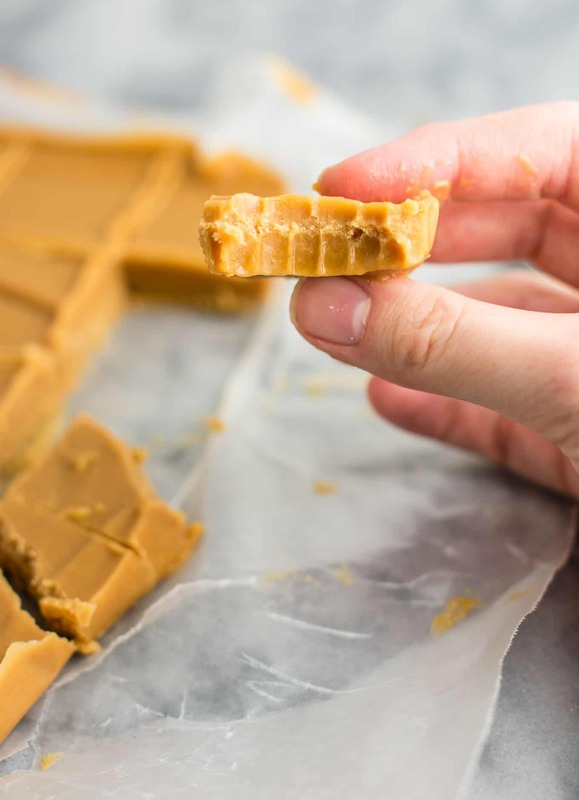 This fudge is basically my perfect dessert. I’m super sensitive to too much sugar, and get a sugar headache within minutes of eating anything that is loaded with tons of artificial sugar. No headache after this! Just plain delicious sweets that I don’t have to pay for later. 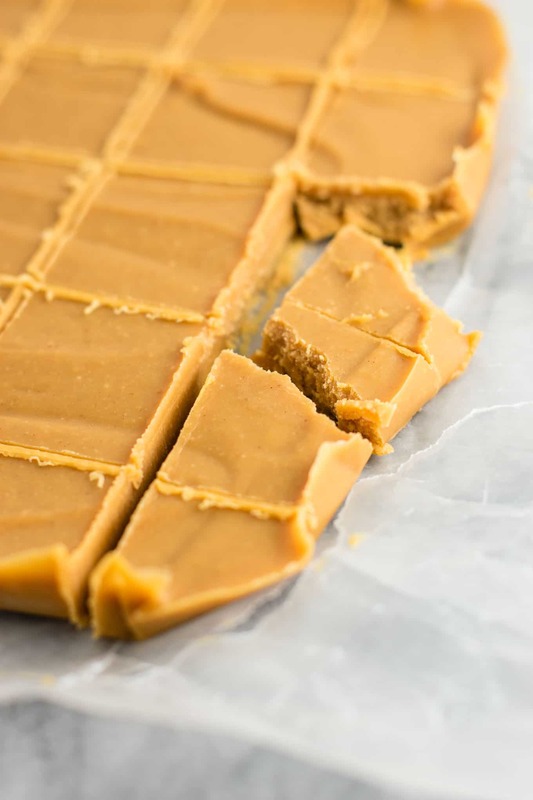 Store this healthy peanut butter fudge in the freezer for best texture (in my opinion), but the fridge would work as well. You just want to keep the fudge cold to avoid it melting. It will melt pretty fast at room temperature. I recommend keeping it in the freezer and just grabbing a piece when you want some. 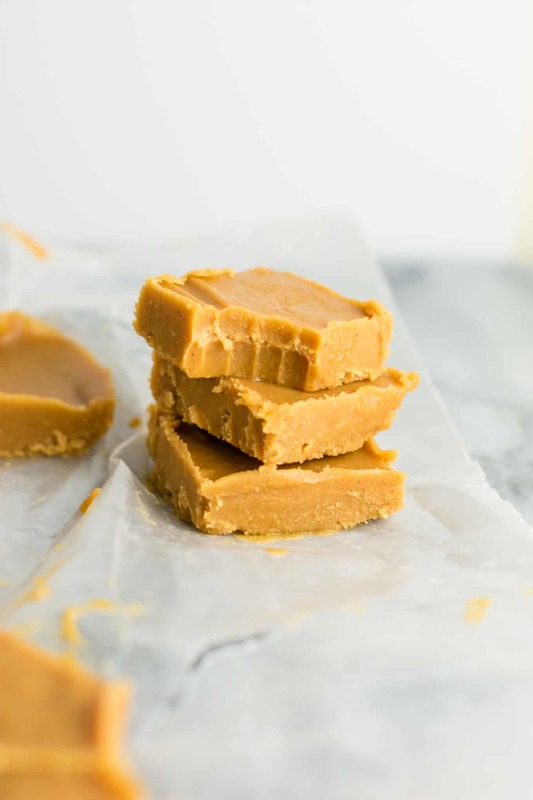 If you love fudge you will LOVE this recipe. I never ate much fudge growing up, but this healthy fudge has converted me. I now look forward to making it every year! Have you made fudge before? If not, I hope you will try this easy recipe! Don’t like peanut butter? You could substitute almond butter! That would definitely work too. Feeling crazy? Sprinkle some chopped chocolate or m & m’s for extra crunch. 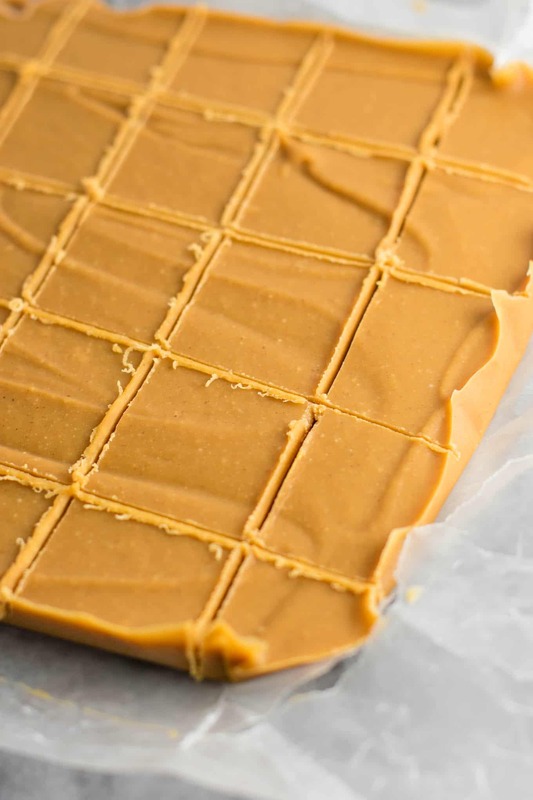 I make a version of this fudge every Christmas and it’s always gone so fast. Are you looking for more desserts? Check out my roundup of 25 Gluten Free Dairy Free Desserts. I used an 8 by 8 dish for medium thick fudge, but you could also use a smaller pan to make thicker fudge. Or for really thin fudge, just use a longer dish. 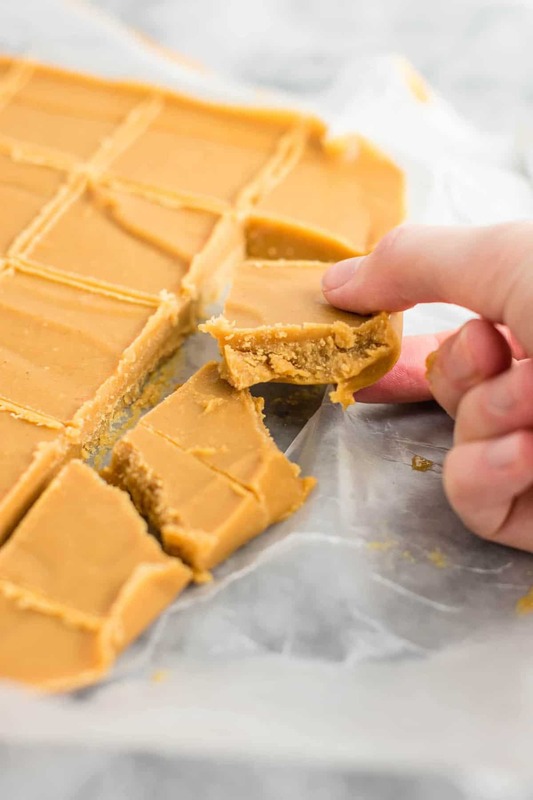 Use a knife to cut the fudge after it has chilled. I serve mine straight from the freezer but you can also store in the fridge! Thanks for the recipe! How does it do outside in the heat? Will it melt or does the coconut flour help? Any acceptable substitutions for the coconut flour? You could omit it, but the texture would be more runny. I have not tested it without coconut flour, so I cannot confirm if it would work. The video does not show you cooking the fudge but the recipe shows you DO cook in a saucepan. ???? You can do it either way! If you do not want to cook with a saucepan like in the video, simply melt the coconut oil and peanut butter first like shown before mixing with the other ingredients. Otherwise just follow the instructions in the recipe card. I wanted to show both options! Healthy + peanut butter is all i need and I’m sold! haha this looks really simple to make too so I’m sure I can’t mess it up, thank you! I love this recipe- I’ve made it a few times now. The unthinkable has happened: I forgot a batch in the freezer! Any ideas on how long it lasts in there? Thank you! Oh no! If it’s an airtight container it should be good for at least a few months!